Bayit Yehudi to head three ministries, not four, but will get appoint a deputy minister to Ministry of Religious Services. Coalition talks continue between Likud, Yesh Atid and Bayit Yehudi (Jewish Home). Talks are expected to draw to a close Wednesday or Thursday, allowing Prime Minister Binyamin Netanyahu to report back to President Shimon Peres before his Saturday night deadline. There are reports that MK Rabbi Eli Ben-Dahan will be appointed as Deputy Minister of Religious Services, and no minister will be appointed above him. A similar tactic was used in the last government, in which MK Yaakov Litzman served as Deputy Minister of Health, but as there was no Health Minister, in effect acted as minister. The agreement with Litzman allowed Netanyahu to give the Yahadut Hatorah (UTJ) faction a ministry without officially making Litzman part of his cabinet, thus allowing the hareidi faction to maintain its policy of not fully joining the government. The rumored agreement with Ben-Dahan would allow Netanyahu to give the Bayit Yehudi party oversight of a fourth ministry in practice while technically still fulfilling the Yesh Atid party’s demand to restrict the number of ministerial appointments in the new government. Bayit Yehudi is reportedly receiving the Minister of Industry, Trade and Labor post, which will go to party head Naftali Bennett, the Housing Minister post, to go to MK Uri Ariel, and the Minister of Diaspora Affairs and Jerusalem post, which will go to Uri Orbach. Bayit Yehudi leaders have previously emphasized the need for reform in the Rabbinate and the Ministry of Religious Services in order to make both more friendly to the largely non-religious Israeli public while at the same time maintaining their adherence to Jewish law. 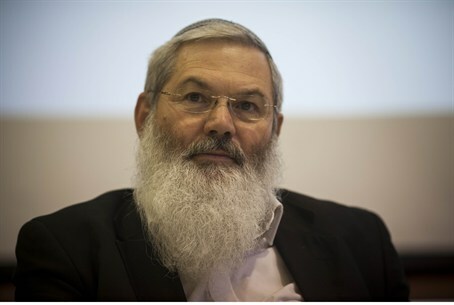 In a recent interview with Arutz Sheva, Rabbi Ben-Dahan noted that making change in the Religious Services ministry is likely to be difficult, as the ministry has been staffed by supporters of the hareidi-religious parties that took turns heading it for many years, who may be hostile to a new approach. “We aren’t the American system, where all of the staff changes when the government does,” he noted. Coalition negotiators are still trying to resolve conflicts over the Education Ministry and the Finance Committee. Both the Likud and Yesh Atid parties want to appoint the next Education Minister, and Likud, Yesh Atid and Bayit Yehudi are all hoping to appoint the next head of the influential Finance Committee. Sources in Likud said Tuesday that Netanyahu is frustrated by Yesh Atid’s “inflexibility” regarding the Minister of Education post, and is considering pursuing a partnership with the hareidi-religious Shas party instead. Netanyahu was reported to have subsequently met with Shas’ Eli Yishai. Netanyahu would not have enough seats for a majority coalition without Yesh Atid and Bayit Yehudi unless the Labor party agreed to join him. So far Labor head Shelly Yechimovich has voiced firm refusal to join the government; however, she recently said her party would be willing to save the coalition if Netanyahu were engaged in diplomatic talks with the Palestinian Authority.